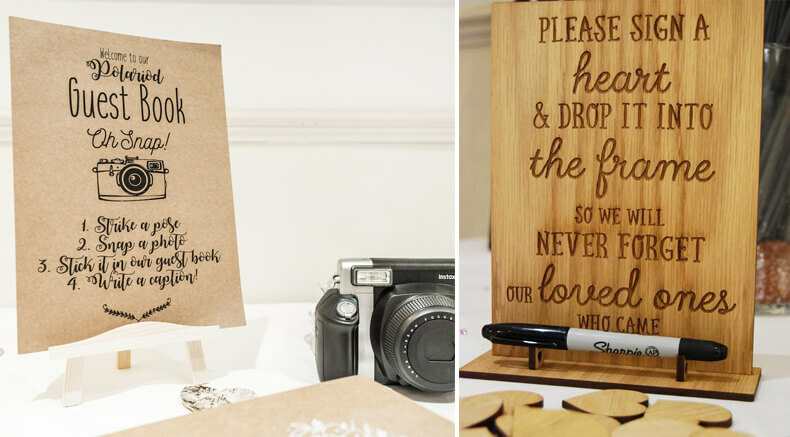 The past couple years has seen a huge rise in the use of quirky wedding signs. Whether they are for navigating guests around your venue, encouraging the partaking of wedding activities or to evoke the right type of atmosphere for your special day. 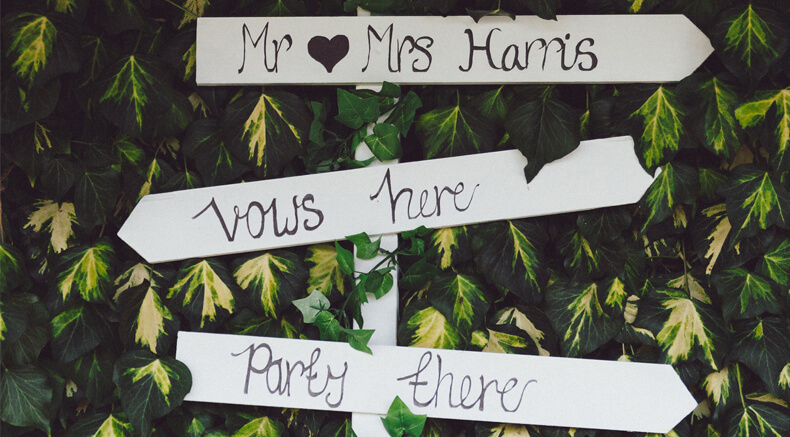 Through a simple wedding sign you can add humour, emotion or romance, it’s just knowing what words to use. To help with your sign inspiration here are some fantastic ideas, which your guests will adore. The movement away from tradition has increased over the years, saying good bye to the likes of tossing of the bouquet and the use of blue pin, pink pin for seating at the ceremony. Where to sit at a ceremony can cause confusion, so using wedding signs are a great way to make guests feel at ease and know where to go. Getting kids involved in the wedding not only offers adorable photo opportunities, but also helps with behaviour. If a child feels important and included, they will have a sense of purpose and responsibility. 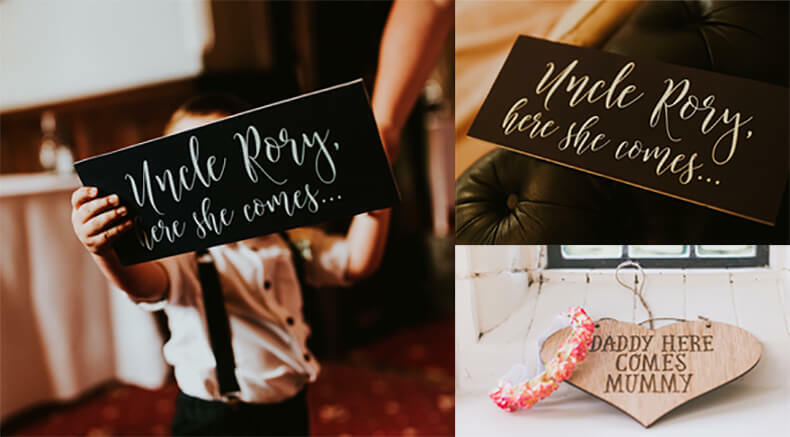 Encourage your little bridesmaids/page boys to walk nicely down the aisle with a ‘here she come’s sign’… It’s a very important job don’t you know! If you’re having a big wedding event with plenty of entertainment, sign posts are always useful. This helps guests find out exactly where to go and makes sure they don’t miss out on anything. This also works well for outdoor weddings, adding a bit of personality and style to your event. A great trend for weddings are little personalised keepsakes and messages for the couple to enjoy after their day. Messages on Jenga blocks, wishing tree’s and polaroid selfies are all great ways to receive nuggets of advice and well wishes from guests. 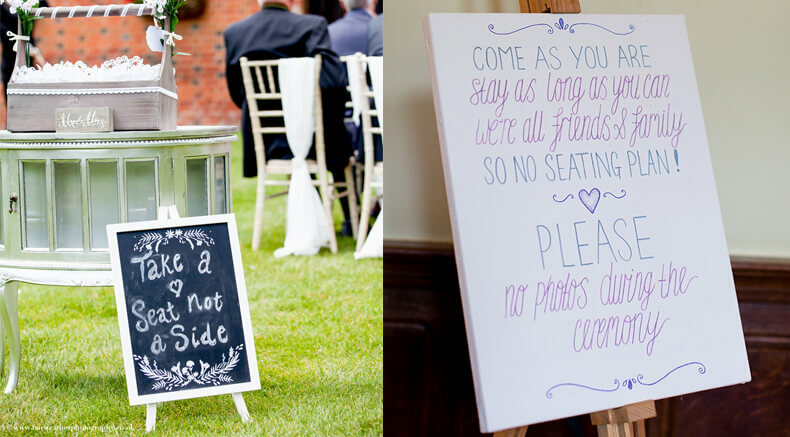 Encourage your guests to take part with a cute wedding sign, so they know exactly what to do. 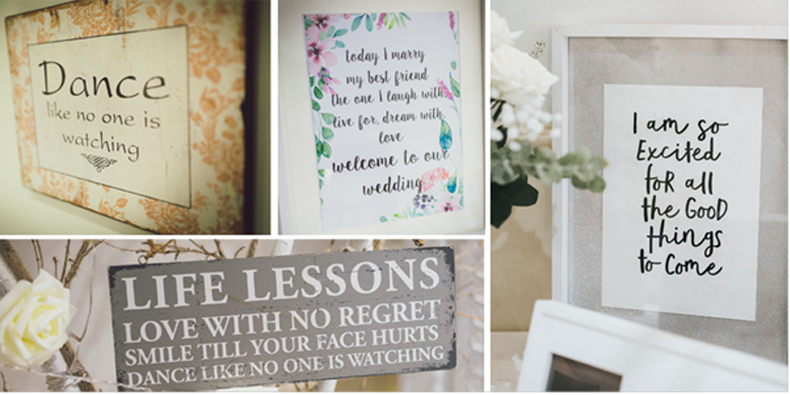 If you’re a couple who loves an inspirational quote, or messages of love around your home, why not incorporate this into your wedding day. It will encourage feels of romance, love and togetherness which is what weddings are all about. Guests love a little treat at a wedding. 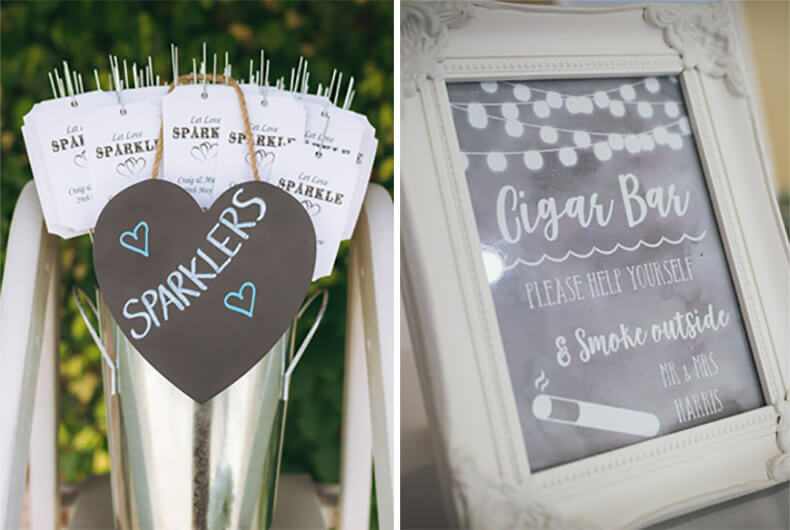 Whether you want to save their dancing feet or celebrate your nuptials with a sparkler these little pleasures can be left all over your venue. Let guests know that they can take one with a cute little sign. Instagram is now a major part of events; every guest has become a photographer. If you want guests to take pictures of your wedding and display them on social media, it can be hard to keep up with who has taken what. Ask guests to #hashtag your wedding with your very own tag, so you can simply search afterwards and see your special day through their eyes. 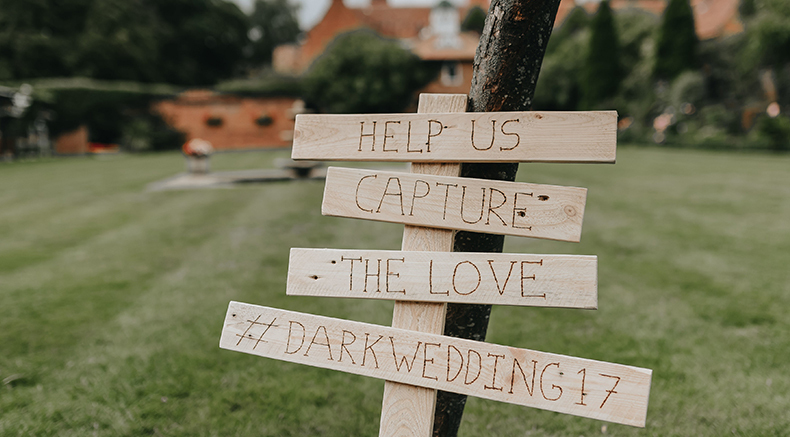 If you are after some inspirational sign ideas, give our weddings team a call on 01394 411 288 or email info@woodhallmanor.com.